Do you ever reach Sunday and feel so thankful that your week has come to an end? I don’t feel like that often, but this week has definitely been “one of those” weeks. Kind of felt like we were the ringmasters of a three-ring circus. 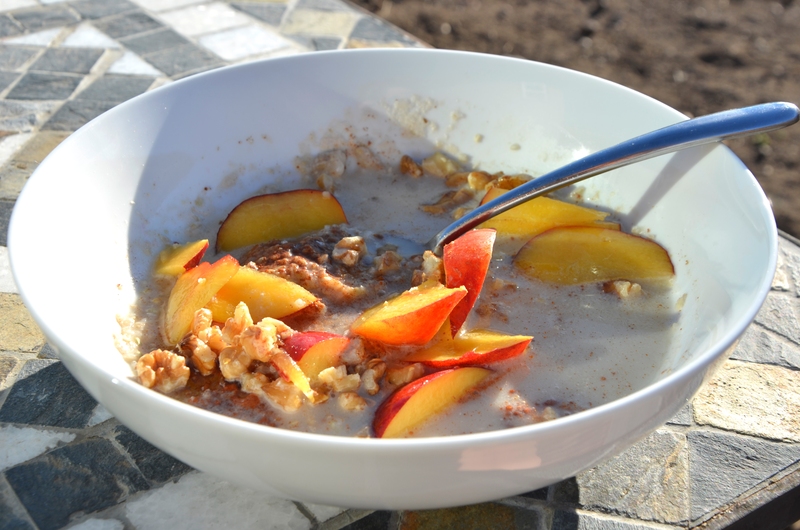 This morning’s breakfast was organic creamy buckwheat hot cereal. Buckwheat is actually a fruit seed related to rhubarb and sorrel, not a grain like many people think. I added organic unsweetened almond milk, organic nectarine, organic cinnamon, organic walnuts, and a tad bit organic raw honey. A few unsavory things transpired this week that we had to deal with, but the highlight of our delightful week? My husband was let go from his new job along with over 100 other employees including his boss who had been with the company for 17 years. His boss was informed 20 minutes before my husband who had worked for that company for 3 months was informed. They brought in a new CEO and that person revamped the company’s sales force and gave three-quarters of them their walking papers. If you have any experience with the corporate world, you know unfortunately, this is not unusual. Business is business. And business in this day and age is not what business was like “in the good old days” where you devoted your expertise to one company who was equally loyal to you for your entire career. So now we begin a new journey (another one! ), trusting that everything most certainly happens for a reason and for our good. Prayers for stress protection for both of us and employment opportunities for Tony would certainly be welcomed if you feel it in your heart to add us to your prayer list. 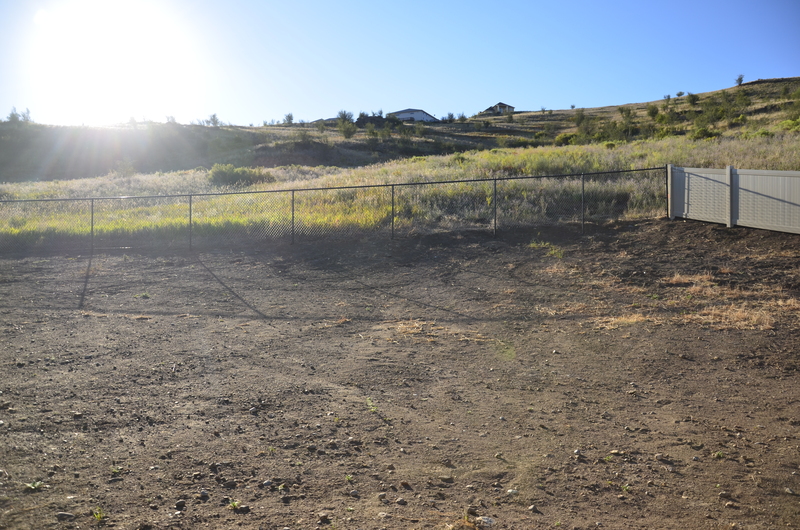 We chose a see through fence along the backside of the property as it is owned by the county and not allowed to be used for housing. As you can see we’re still staring at a backyard full of dirt. We switched landscapers after getting a rather frightening quote from the first guy. We had to put off the landscaping for three weeks with guy #2 but the price was worth the wait and we didn’t have to set aside any landscaping ideas like we would have with guy #1. 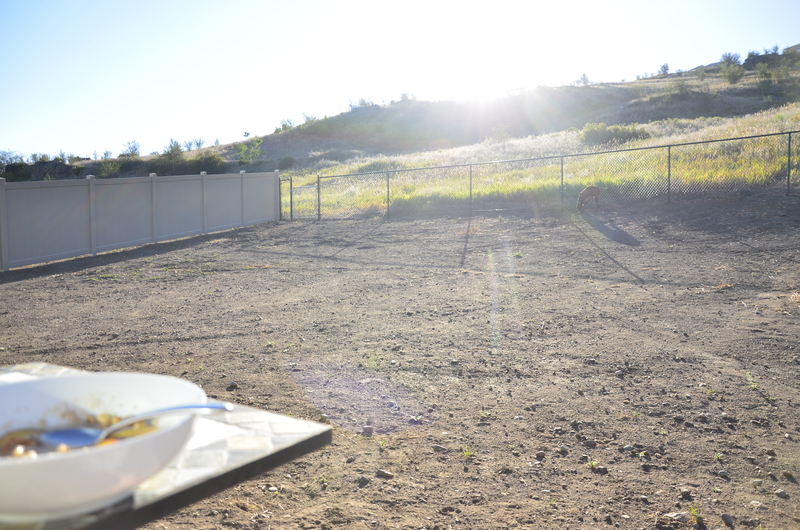 Even with the dirt backyard, watching the sunrise and breakfasts on the deck are delightful. A peaceful blessing! 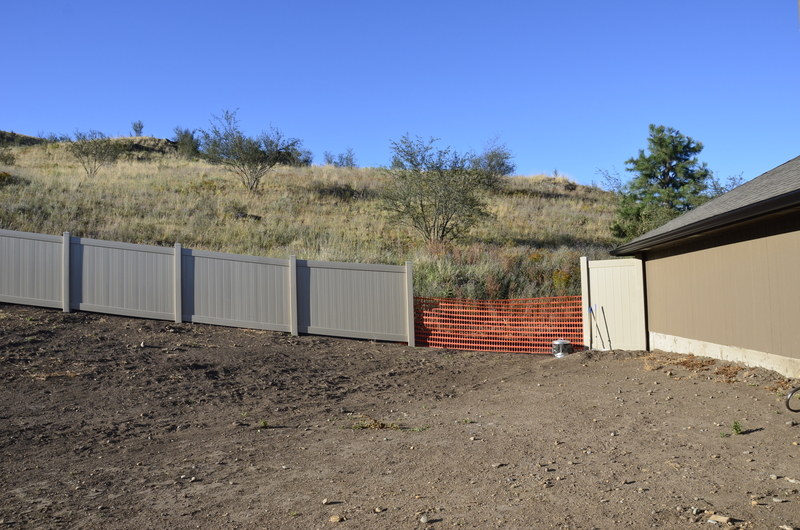 Our experience with the fence company has been…problematic. They didn’t show up two days in a row when they said they would. I had to make a call in my serious mother voice in order to get them out here. Then, we had to have one of the posts removed so the landscapers would be able to get into the backyard with their equipment. When the fence people were removing it with a borrowed piece of machinery from the builders next door, they destroyed the post. Then when they were backing up…destroyed another one. I kind of had to chuckle after all of that. What’s left to do? And of course, they were the more expensive gate posts. Prior to this happening, my husband came in from out of town and realized they had cracked our bran new driveway with their big truck when there was plenty of room for them to avoid the driveway all together. Not a good situation. Thankfully, the posts will be fixed (not on our dime), the driveway has been “patched” although not to my husband’s satisfaction, and fingers crossed, they’ll hang all the gates properly when the landscaping is finished. 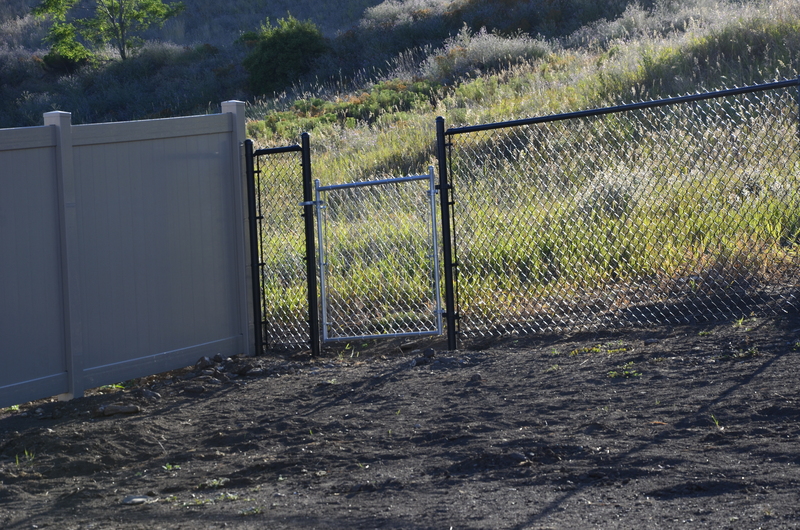 They hung a temporary gate while our gate is being powder coated to keep the dogs from roaming. However, they left an 8 foot gap in the fence on the other side and didn’t hang anything temporary as discussed. At this point, I just had to shake my head. Such lack of attention to detail. Then I noticed several of the fence boards are dented and scratched. So I had to make another call in my serious mother voice and have them come out again to hang the orange temporary mesh and remove the posts they dug out of the holes and just left lying in the yard in the path of the landscapers. We were told to place painter’s tape on the damaged fence boards and they’ll be replaced. We went with a 5 foot fence on this side of the house as no building will be permitted there either. Abigail is mortified that she has to pee in dirt. She stands in the middle of the “yard” and looks back at us like, “you want me to pee in THIS?” Romeo is fine with it and has found it quite entertaining to jump around smacking his paws in the dirt and making huge dust clouds. Abigail and I would never make it in the old west. Dust…ugh. 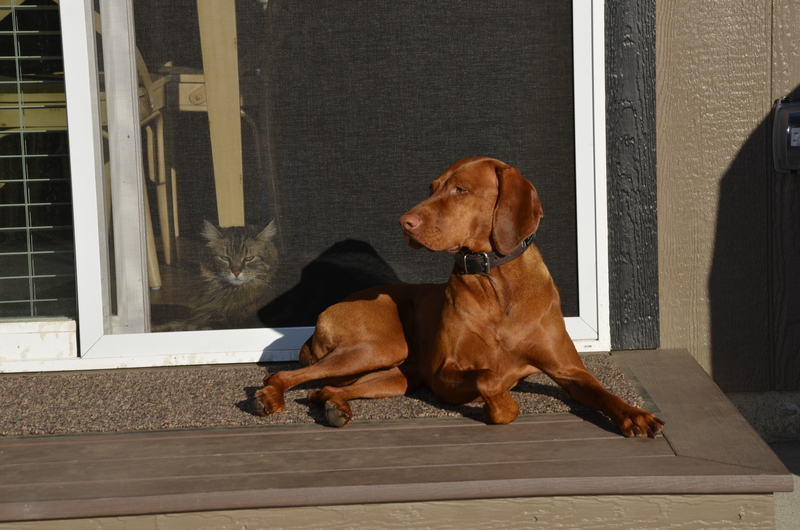 Notice the cat is on the inside of the screen. We hadn’t realized she was out the other night and spent the entire night outside and then the entire next day in a window well that she was too old to get herself out of. She’s typically a grumpy, snobby cat, but after that adventure, I noticed she was quite happy to see me and be back inside the comfort of a home full of self feeding cat dishes and kitty treats. That’s what’s happening in our neck of the woods. Never a dull moment with us. Looking forward to an uneventful Sunday a peaceful week ahead, and wishing you the same! We will definately put you on our prayer list! So sorry for all the trials you are facing. You poor thing, what a horrible week. I think I would have the fence people hanging off of one of the posts. What a bunch of jerks. You are in our prayers and that will make the next week all come together well. The Lord be with you and Tony. Hang in there Kid. Did not know that about buckwheat. Cheers for the heads up!! Thank you Charlie, we sure appreciate your prayers! And I will pray that your property changes run smoothly from here on out. Such a frustration! How awful for your father. What a shocker that must have been for him and your entire family. It’s sad and I’m not really sure why things work the way they do these days.You would think with loyal employees, as long as they are good at what they do, your business just can’t go wrong. But for some reason, there’s always those few people who think they know better and the financial aspect now is considered well before the personal aspect of business. Tony had only worked for that company for 3 months. Still a shocker for us of course to have to make another change so early into it, but I’m sure our shock was nothing like the people who had devoted their careers to that company. Just let go as if their contributions meant nothing. This world. Such a mess.